hungry – Welcome to Athletes C.A.R.E. Athletes C.A.R.E. in Patriot League Network Video Special! Our organization recently received some recognition when we were featured by the Patriot League Network in a feature video. You can view the video below! Be share to share the video and spread the word about Athletes C.A.R.E. Follow Athletes C.A.R.E. on Twitter. On June 9th, 2013, Athletes C.A.R.E. received its first-ever award, being recognized by the City of Easton and Easton Area Neighborhood Center for outstanding service to the Easton Area community following our ‘ALL-OR-NOTHING’ Campaign hosted by WeDidIt. The campaign raised over $6k, all of which was donated to the Roof Over Shelter in downtown Easton to support those in need. A big ‘Thank You!’ goes to all those involved in the fundraiser, helping raise an incredible amount of money for an incredible cause! Additionally, we’d like to thank the Easton Community as we are honored to have received such an award and we look forward to continued service to the Easton-area. We finally had the opportunity to visit the Roof Over for Women and Children Shelter in Easton, PA to deliver our $6,081 donation, raised with the help of so many during our 60-day All-Or-Nothing Campaign earlier this Spring. The donation will go directly to the shelter to help purchase beds, blankets, mattresses, pillows, and the like. We could not be more thankful for the love and support we received during the campaign. With your support, we were able to make a great difference in the lives of those in need. We look forward to continuing a relationship with the Roof Over Shelter for years to come! Since partnering with the student-athletes of Stevens in Hoboken, NJ, we have been extremely excited to see how many more individuals we can reach using their help and resources. With that said, the student-athlete-lead branch of Athletes C.A.R.E. at Stevens Tech will be hosting their first ever fundraiser to benefit Athletes C.A.R.E. The fundraiser will be held at Giovanni’s Pizzeria & Restaurant on Monday, May 6th, beginning at 5pm. With their help, 10% of the proceeds raised will come directly to our organization! Please join us for some food and fun, raising money to further the mission of Athletes C.A.R.E.! Please check out the flyer below for more information! On Sunday, April 21st, Athletes C.A.R.E. hosted its first-ever Kicking4Hunger Soccer Clinic in which children were asked to bring canned food items as their fee to participate in the clinic. These items were then donated to the Nazareth Food Bank of Lehigh Valley to benefit the needy, hungry, and homeless. The clinic was extremely successful, raising over 400 canned food items with 70 kids participating in the day’s event! Check out our media page to look at more pictures from the day! We look forward to making the Kicking4Hunger Clinic an annual event! As part of our continued efforts to serve the needy, hungry, and homeless, we will be running a Kicking4Hunger Event hosted at the Metzgar Athletic Complex of Lafayette College. The soccer clinic will take place on Sunday, April 21st from 1pm to 4pm, taught by Lafayette College Men’s and Women’s Soccer Players. The clinic is open to children ages 5 to 11. Here’s how it works: Instead of paying a fee to participate in the clinic, it is asked that children and their families bring canned food items as their cost to participate. These food items will then be donated directly to a Lehigh Valley Area Food Bank to help those in need. It’s pretty simple! Children get to learn from and play with Division I soccer players in a 3 hour clinic of all sorts of fun and games…and all they have to do is bring canned food to help the community! It’s truly and awesome cause and we certainly hope to see you or your children at the day’s event. Sign up your child by clicking the ‘SIGN UP’ link below. All information regarding the time, date, and location are listed below. If you wish to learn more about Kicking4Hunger, please visit their website by clicking here. ALL-OR-NOTHING Campaign to begin soon! We are quickly approaching the start of our ‘ALL-OR-NOTHING Campaign’ to raise $1,000 for the Roof Over for Women and Children homeless shelter in Allentown, PA! All money raised, if over $1,000, will go directly to the shelter for the purchase of necessary items such as bedding, blankets, pillows, mattresses and the like. As a donor, your money will be pending until we raise our goal of $1,000. If, for some reason, we do not reach our goal, we will unfortunately lose all donations for the campaign, with money returned to the donors, and no funds available to donate to the shelter. We need your help! Please get involved when the campaign begins, share the information regarding the campaign on social networking sites, and spread the word! We will have a promotional video to advertise the campaign as well with a link to share. Help our cause, and as always, get out and care! Roof Over for Women and Children Shelter in Allentown, PA. This spring, the Athletes C.A.R.E. team has a lot on its plate. In the coming months, the organization will be hosting an ALL-OR-NOTHING Campaign with the goal of raising $1,000 for the Roof Over for Women and Children, a homeless shelter in Allentown, Pennsylvania. Any and all donations will be pending until the $1,000 goal is reached – if the goal is not reached, the donors will be returned their money, and unfortunately, we will not reach our donation goal for the Roof Over shelter. We will post our promotional video online to be shared through the various social networking avenues. We will ask that anyone interested in helping, donate to the cause and share the video so that we can receive as much exposure as possible for the campaign. The campaign will last for roughly a two month period with the ultimate goal of raising $1,000 to help the Roof Over for Women and Children purchase the necessary items such as pillows, blankets, bedding, and the like, to further furnish their facilities. Please look for the video and be sure to share it with friends and family, as well as join the cause by donating to help those in need. The campaign will begin by the end of February, so be on the look out! Thank you all for your help. H.U.D.D.L.E. Program Kicks Off This Fall! 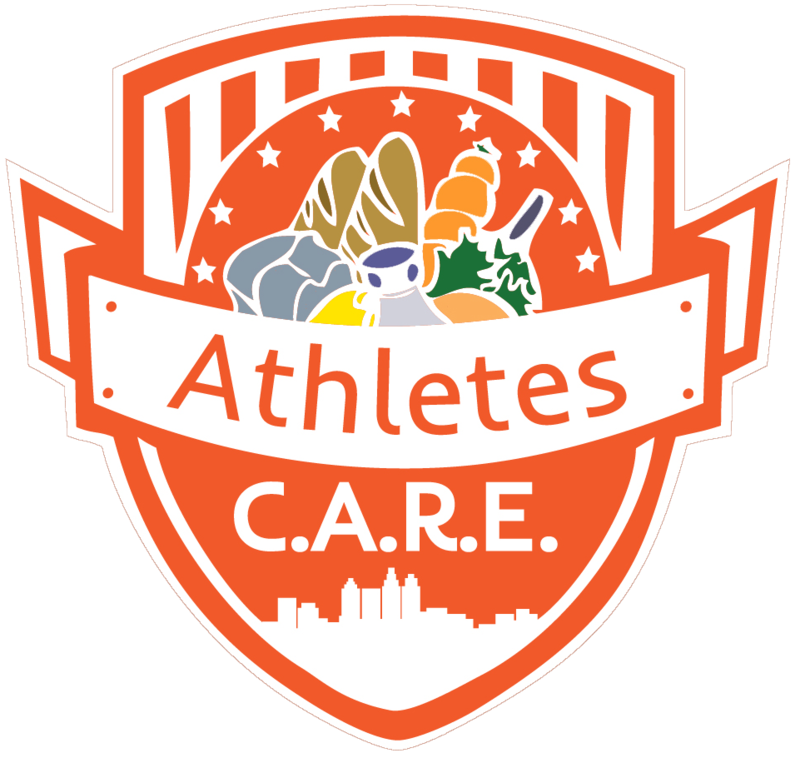 New Look for Athletes C.A.R.E.